Friday, October 17, 1980—breakfast was over by daylight. Put up another wall, cut a window and put up a few logs on the next wall. I don’t have a drill to drill holes and I have to drive the logs together with these big log spikes with a three pound hammer. Cut 30 more logs. (It’s partly cloudy and a nice temperature to work.) Cut and trimmed most of the rafters, light snow this evening. Saturday, October 18, 1980—up early, two-sided logs until 3 p.m., then spiked some to the cabin. Occasional light snow, really a warm and nice day. Sylvia pulled all of today’s logs in on the puka sled. Sunday, October 19, 1980—two-sided more logs and finished the walls and cut another window, sawed boards for the door, and put the plates on top of the logs. It’s been a nice warm day. 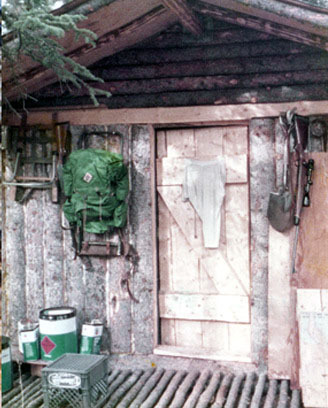 Monday, October 20, 1980—finished putting up the end logs, the ridgepole and started the rafters. We put the plywood sheeting on the rafters as we went along. Finished the roof on the east side and got three rafters and two plywood sheets on the west side. Sylvia really likes the cabin shaping up. One night when we were sleeping in the tent, we could hear something walking around outside it. She was really concerned about what might be walking towards the tent. Listening, I knew it was a porcupine. If you’ve ever seen a porcupine walk, you’ll know what it sounds like in the snow. Tuesday, October 21, 1980—finished the roof on the east side and got three rafters and two plywood sheets on the west side. Chris Ronning flew in and landed with wheels on our little lake. It’s frozen over now. I got in some firewood while he went after oil and insulation for us. (He brought back a bottle of whiskey.) Then he took off just as it was getting really dark. Before he left, he asked me to cut down two trees farther out, away from the lake in the landing line and take off strip. Wednesday, October 22, 1980—I packed in more plywood, finished putting up the rafters, and ceiling, built the door and put in the windows. We moved the stove here and moved into the cabin to sleep. I am more pleased with it every day. We had a beautiful sunset. Sylvia is very glad to have solid walls to sleep behind. Thursday, October 23, 1980—got up late, nice to be in the cabin. Got the press plates tarred and put onto the roof—these press plates are aluminum sheets that the newspaper press in Anchorage has left over when they publish their daily paper. I tarred in between the plates as I put them on the roof. Then we got some firewood in, cut and stacked up. After that, we chinked on the inside of the cabin until 11:30 p.m. We have a Coleman lantern so we have light at night. Friday, October 24, 1980—chinked more logs, packed plywood and sawed lumber and built the kitchen, bunks and went hunting. Saw a small hawk, and huge bear tracks (measured two inches longer than my shoes). Saw no game today and chinked more logs in the evening by the light of the Coleman lantern. Saturday, October 25, 1980—we had breakfast before daybreak. It’s frosty and foggy and I went hunting for a while with no luck. Built a bench and table. Put some finishing touches on the inside and out of the cabin. Hunted up some more trees to cut for firewood. Chinked some more tonight. Sunday, October 26, 1980—foggy and frosty again. Cut eight dead trees and cut up and stacked the wood. Saw a big hawk. We chinked on the cabin and built a sawbuck to buck up wood for heating. Put metal guards around the trees that the cache is in to keep varmints from crawling up and getting inside. I have two 55-gallon drums up there on the cache to put food and other things—protect them from the weather and varmints. Monday, October 27, 1980—took Sylvia to a hill to see the great view from there. Cut and stacked more wood and built five dog houses and put up the cable to tie the dogs (bedded down with spruce boughs). Really tired tonight. Tuesday, October 28, 1980—I did a few finishing touches and Chris flew in this morning to fly us out. Sure hate to leave the cabin. We landed at Billman’s, ate dinner and then went to Nelchina. Partied this evening. This entry was posted in Journal Entry and tagged 55-gallon drums, cache, chinked logs, firewood, trapper cabin, two-siding logs. Bookmark the permalink.